Rhodes Scholars didn't always look like Serene Singh. And as a child in middle school, she pondered how different they were from her. Singh is a newly minted Rhodes Scholar, off to study at Oxford University in the fall of 2019 in a program that awards the smartest, most hardworking and successful college seniors in the U.S. to the prestigious British university. She said she believes she is the first Sikh-American Rhodes Scholar and one of 21 women — the largest number of women ever in a U.S. Rhodes Scholar class. The Rhodes Trust does not track religion, said Elliot Gerson, U.S. national secretary for the Rhodes Trust. He told VOA he believes Singh is correct. In addition to exceptional grades, she started a nonprofit to empower women, coached a speech and debate team, and hosted the first Sikh langar, or community meal, at Colorado University in Boulder. Her LinkedIn page lists a litany of accomplishments: Truman Scholar, Dalai Lama Scholar, president of her law fraternity, chief justice of the judicial branch of student government. All testimony to a driven life by her 21st birthday. But stuffy, she’s not. As high school class president, Singh didn’t just give her commencement speech, she rapped it, concluding with a literal mic drop. “Tough act to follow,” said principal Pete Alvarez, looking a bit chagrined. Singh will join 31 other Americans on the scholarship that was founded in 1902 after the death of Cecil Rhodes. Each scholar is afforded two to three years of graduate education at Oxford University. Singh plans to pursue a master’s in criminology and social justice, as well as a master's in a program called evidence-based social intervention and policy evaluation at Oxford before applying to law school. The first four female Rhodes scholars entered Oxford in 1977. In his will, Rhodes restricted the scholarship to men. An act of parliament was required to include women, according to Gerson. “Since that time, women have been eligible. And there have been occasional years in which more women than men have been elected up, but never as many as this year,” he said. The U.S. class of 2019 Rhodes scholars is the most diverse in the program’s history, with over half of the 32 scholars being immigrants or first-generation Americans. Women’s equality and empowerment are among the issues most important to Singh. She started a nonprofit, the Serenity project, to bring a broad range of women to participate in a pageant to boost their confidence, work on their public speaking skills, and later be paired with a mentor. “Women that have gone through trauma, discrimination, through hate crimes, through domestic abuse, through human trafficking, through foster care. … There's so many different experiences that women have gone through in the United States,” she said. Fashion therapy is the first step of the Serenity project, helping women feel beautiful and confident, which they may not have the opportunity before. That approach was inspired by her experience in pageantry. “I joined pageantry because I had a bias against it,” she said with a laugh, noting that doing things she thinks she will hate is one of the ways she challenges herself. 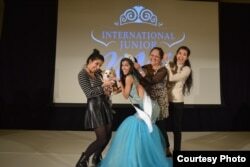 But Singh soon found that despite the stereotypes surrounding them, pageants were an excellent way to boost confidence. “I gained skills in terms of public speaking, interview skills, poise and presentation, and just overall confidence and self-esteem, which was huge for me,” she said. The skills and confidence she gained from pageantry bolstered her perfect academic record, relentless work ethic, and sense of service that led to her selection as a Rhodes scholar, according to Ross Taylor, one of her journalism professors at CU. In addition to empowering women, Singh has worked closely with Sikh organizations in Colorado and the U.S. to bring more awareness to her faith and culture. “She has definitely been an asset to our community,” Dilpreet Jammu, president and executive director of Colorado Sikhs, told VOA. “She's just involved in so many facets in terms of everything from education, to engagement, outreach, all the things. So, I think she really exemplifies what the next generation is all about,” he said, adding that he was particularly proud that the first Rhodes scholar in their community was a woman. “I just love the fact that our daughters are the ones who are stepping up now,” he said. Singh founded CU’s first Bhangra team — an Indian dance popular in university competition circuits throughout the U.S.
After a woman on campus spread hate speech, Singh’s team decided to fight back with their feet: A dance they performed in response to her words went viral on social media. Singh believes that her background as a Punjabi and a woman of color in Colorado will inform her future role in the world. “It's very important that we're putting more voices to the table people that are ready to fight the world’s fight,” she said.